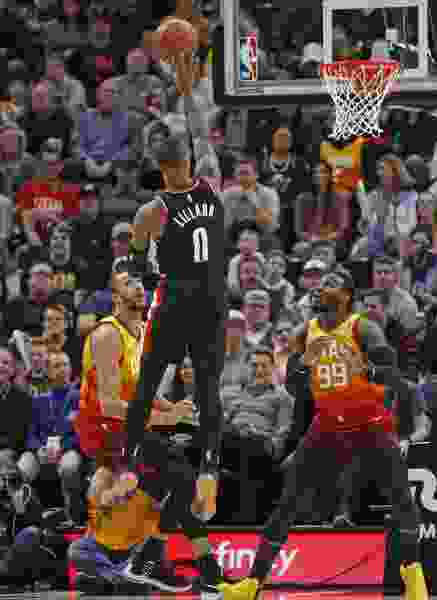 That was one of the words Quin Snyder used to describe his team’s defensive performance on Monday night, allowing the Blazers to score 65 second-half points on the way to a 109-104 win over the Jazz on Monday night, snapping a 6-game winning streak. “When you’re winning, you can have slippage. If we get out of character, and don’t defend the way we need to — that’s the formula we need to win,” Snyder said. Here’s another word Snyder used: “disparity.” That one came in reference to the difference between a second quarter where the Jazz’s defense was familiarly stifling, allowing just 15 points to the high-octane Blazers, and the 39-point Portland quarter that followed, as Jusuf Nurkic, Damian Lillard, and C.J. McCollum found whatever success they wanted. In particular, the pick and roll threat of Lillard and Nurkic picked apart the usually stout Jazz defense. While Rudy Gobert left Nurkic to ensure Lillard didn’t have open threes in the perimeter, Lillard found the Bosnian big man open deep in the paint for 17 third-quarter points, without a whole lot of Jazz resistance. But while Lillard played well enough in the fourth, it was actually the minutes before the All-NBA point guard re-entered the game that killed the Jazz. After a Jazz 7-0 start to the fourth quarter, Blazers head coach Terry Stotts called timeout, immediately leading to an 18-4 Blazers run by their bench. Meyers Leonard and Jake Layman were the heroes for Portland during that stretch. On the other end, the Jazz’s shooting went cold. Crowder, Kyle Korver, Royce O’Neale, and Joe Ingles all missed open threes that would have turned the tide in the home team’s direction in the fourth, all of which which bounced off the rim. Donovan Mitchell missed a couple, too, but his attacking verve nearly led the Jazz to a comeback. Mitchell’s 14 fourth-quarter points — albeit on 4-11 shooting — scared the Blazers. In the end, despite the 11-point lead that the Blazers had held earlier in the third, the game came down to Ingles missing an open corner three in transition with 10 seconds left, shutting the door on the Jazz’s chances. Ricky Rubio made his return to action in the contest after missing six games due to a hamstring strain. Because of a minutes restriction in his return, Rubio started the game on the bench, entering in the contest at the 4:15 mark of the first quarter. Rubio understandably looked more comfortable in the game’s second half than its first, and finished with 12 points and one of the team’s only positive plus-minus impacts in the game. The Jazz noted playing on the holiday — Martin Luther King Jr. Day — in several ways. After 6-year-old Victory Brinker from Pittsburgh delivered a rousing national anthem, Thurl Bailey gave an emotional pre-game address to the crowd on the importance of the day. The organization also hosted a workshop and clinic before the game, including 60 children from Calvary Baptist Church.